There has been a string of media reports noting a drop in U.S. corn exports to Mexico. This post considers recent data to see if the corn-sky is falling. In recent months there has been a string of media reports that go along the lines of this: exports to Mexico, especially corn, have fallen in light of cooling trade relations. Most of these reports present a decline in U.S. corn exports to Mexico in the first several months of 2017 when compared to the same time-period in 2016. This narrow look at the data made us wonder about the broader trends with U.S. corn exports to Mexico and prompted us to dig into the data. Specifically, this post considers the most recent corn export data to see if the corn-sky is falling. In figure 1, the cumulative monthly exports of corn from the U.S. to Mexico is shown. For 2017, corn exports through May are 4.4% behind the same period in 2016. These data, combined with a few quotes about Mexico wanting to shop for corn elsewhere, can lead to a quite gloomy story. In figure 1, data from 2012 to 2017 are also shown. One can tell that 1) corn exports to Mexico were at a high in 2016 and 2) even though behind 2016’s level, 2017 corn exports to Mexico are stronger than many recent years. 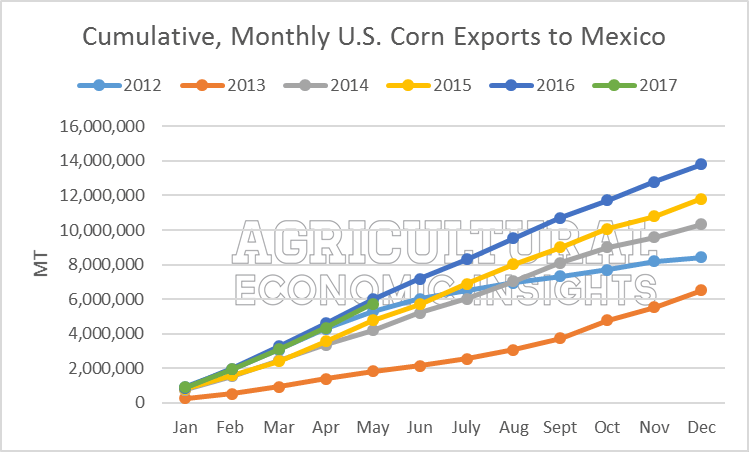 It’s worth noting exports generally trend upward and linearly throughout the year, meaning corn exports to Mexico are generally the about the same each month. There are, however, a couple exceptions. In 2012, exports dropped off during the summer-months. This was with the result of the U.S. drought and the strong price response. In early 2013 exports to Mexico remained sluggish, but picked-up late in the year as the new-crop harvest got underway, and price pressures subsided. Figure 1. Cumulative, Monthly U.S. Corn Exports to Mexico, 2012 to 2017. Data Source: USDA’s FAS Global Agricultural Trade Systems (GATS). A second way of considering current exports to Mexico is shown in figure 2. 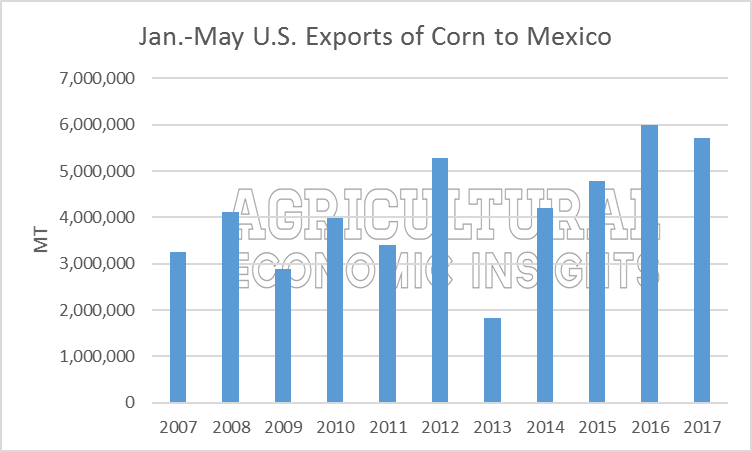 These data are similar to figure 1, but show total corn exports to Mexico from January through May from 2007 to 2017. Again, the decline from 2016 to 2017 is concerning by itself, but one really should consider exports over a longer period. Exports in the first five months of 2017 are the second- largest in 11 years of data. Figure 2. U.S. Export of Corn to Mexico, January through May. 2007 to 2017. Data Source: USDA’s FAS Global Agricultural Trade Systems (GATS). Given several, consecutive years of large U.S. yields and expanding inventories, strong demand – especially in the form of exports- is important. While exports to Mexico in the early months of 2017 have dipped, overall U.S. exports have been quite strong (figure 3). In the first 5 months of 2016 total U.S. exports lagged behind 2014 and 2015 levels, but increased late in the year to finish at the highest since 2012. This was without doubt a huge support for the U.S. corn markets – and price – since last fall. In 2017, U.S. exports from January through are running ahead of 2016 levels. In fact, the U.S. has exports are running 34% over 2016 levels in the first 5 months of the year. Considering U.S. corn exports since 2007, exports to date are the largest of the last 11 years (figure 4). Figure 3. Cumulative, Monthly U.S. Corn Exports (Total), 2012 to 2017. Data Source: USDA’s FAS Global Agricultural Trade Systems (GATS). Figure 4. Total U.S. 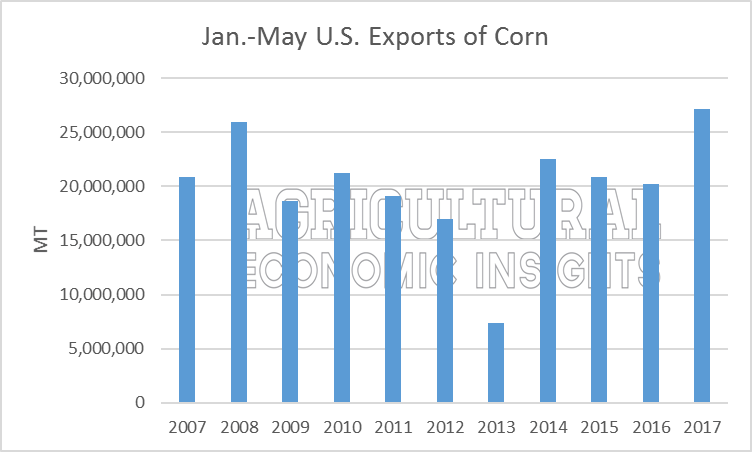 Export of Corn, January through May. 2007 to 2017. Data Source: USDA’s FAS Global Agricultural Trade Systems (GATS). Back to Mexico. Mexico is a critical partner for U.S. agricultural production. In earlier posts, we’ve noted that the U.S.’s top three trade partners are Canada, China, and Mexico. Even in the early months of 2017, with exports to Mexico down and total exports up (relative to 2016), Mexico accounts for 21% of total corn exports. While there has been a lot of political rhetoric about trade, especially given the NAFTA renegotiation efforts underway, it’s worth nothing Mexico’s drop in U.S. corn exports could be the result of building inventories. In figure 5, the ending-stocks to use ratio for Mexico are shown from 2000/2001 to 2016/2017. These data are from the USDA’s FAS Production, Supply and Distribution database. While the time series are a little different, marketing year vs calendar year, the trend in recent years has been for building ending stocks in Mexico. Ending stocks for the current marketing year (2016/2017) are estimated at 16.6%, up from 13.4% last year and only slightly below the 17-year high of 16.9% in 2003/2004. It seems logical U.S. exports to Mexico in the early months of 2017 would be slower than 2016 given the reality that ending stocks – measured as a share of use – have reached the highest level in 13 years. 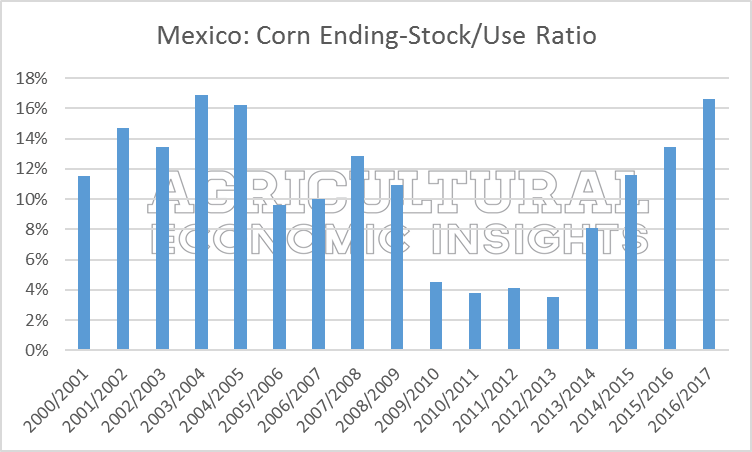 Figure 5: Mexico’s Corn Ending-Stocks/Use Ratio, 2000/2001 to 2016/2017. Data Series Average: 10.9%. Data Source: USDA’s FAS Production, Supply, and Distribution Database. Trade is critically important for U.S. agriculture, especially given several years with strong yields and building ending stocks. Exports are an important a source of demand. 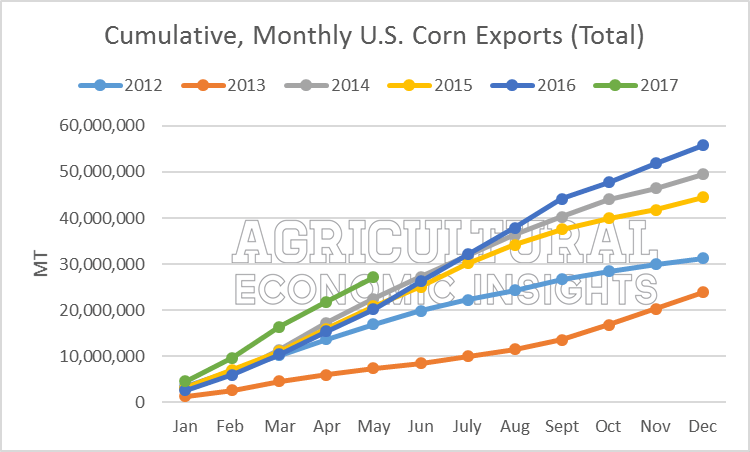 As many have reported, corn exports to Mexico has dipped in the early months of 2017, when compared to 2016. While this is concerning on the surface, especially given the rhetoric, it’s important to consider the broader trends. Exports for the first 5 months of 2017 are the second highest since 2017. Furthermore, the slow-down in exports to Mexico has occurred as ending stocks have reached recent highs. Give the stock situation in Mexico, it seems logical to expect Mexico to be buying less corn from the U.S. – even without a perceived change in political and trade relations. Beyond Mexico, corn exports have been strong. Late in 2016, export turned higher and this trends has continued throughout early 2017. In light of all this, it seems the sky isn’t falling for corn exports, at least so far.